The Minister of State for Transport has spoken powerfully about the importance of beauty in architecture. Addressing the Advisory Panel of the Railway Heritage Trust on Monday, the Right Honourable John Hayes MP said that most of what we had built since the war should be demolished. A stunned silence descended. As a member of the Railway Heritage Trust Advisory Panel, meeting in offices at Euston Station, Simon Rigge was present when the Minister made his speech. He shared the frisson of surprise that greeted the Minister’s straight talking. For too long, continued the Minister, we had thought about function to the exclusion of design. He was setting up an Aesthetics Steering Group – ‘not many ministers convene an Aesthetics Group’ – and would be pressing engineers and architects to think about design before they built. Beauty in architecture had been overlooked. Beauty and truth went together with the divine and we should strive once again to reflect these eternal qualities in our built environment. He wanted the assembled great and good of the railway industry to know that he wholeheartedly supported the work the Trust did to restore and revive the railway heritage. He wanted to see the Euston Arch re-erected when the station was rebuilt. It would be a symbolic act that informed and influenced the design of all the new building required for HS2. We had not done well enough in the recent past. We needed a new beginning. For those of us who have been thinking heretical thoughts for years, but were embarrassed to voice them, lest we offend the architectural and engineering establishment, this was a refreshing dose of frankness. The minister received a resounding round of applause, enthusiastically took questions, overshot his schedule and was quite possibly late for his next appointment. The railway heritage and the virtues of design, good proportions and architectural detail were all enhanced. 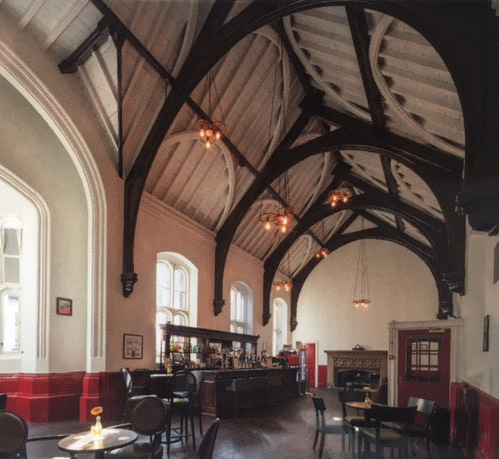 In the picture we see the Carlisle Station bar, recently restored and brought back into use with grant support from the Railway Heritage Trust. For more information on the work of the Railway Heritage Trust, now in its 32nd year, you can visit their website here, or follow them on Twitter @railwayheritage. For another recent speech on beauty by John Hayes, visit the government website. More Articles… The Railway Heritage of Britain, The Railways of Britain, Should Architecture Be Attractive? Honouring Past Craftsmen, Brave New London Bridge? Plans for London Bridge Station, The Regeneration of King’s Cross, Sir George Gilbert Scott, Scott of St Pancras.